Store in a cool, dry place. Empty unused content into a suitable, non-metallic container. Cover and keep refrigerated. Use within 3-4 days. 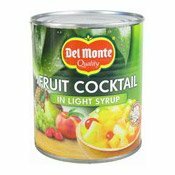 Ingredients: Fruits In Variable Proportions (Peach, Pear, Pineapple, Grape, Cherry With Colour (E127)), Water, Glucose-Fructose Syrup, Sugar, Acidity Regulator (Citric Acid). Simply enter your details below and we will send you an e-mail when “Fruit Cocktail In Light Syrup (糖水雜果)” is back in stock!